Famed silversmith Arthur Nevill Kirk and apprentice Margaret Elleanor Biggar work in the metalsmithing studio at the Cranbrook Arts and Crafts Studios, 1930. Cranbrook Archives. In this scrapbook page from 1930, “Miss Margaret Biggar” and “Mr. Arthur Nevill Kirk” are found working in the metalsmithing studios at the arts and crafts studios, the predecessor to the Cranbrook Academy of Art. An English-born silversmith, Arthur Nevill Kirk came to Cranbrook in 1927 at the urging of George Booth, who contracted him to produce silver designs for Christ Church Cranbrook. Kirk eventually taught silversmithing at the Cranbrook Arts and Crafts Studios before going on to found the Metals department at Wayne State, where he worked until 1957. We at the Kitchen Sink are excited to use this post as an opportunity to promote not just the amazing history of Arthur Nevill Kirk but also highlight a new edition to the Cranbrook social media landscape – Cranbrook Archives’ Facebook page! As the beating heart of the Center for Collections and Research and the repository for all things historical at Cranbrook, the Archives uses Facebook to promote its extensive holdings, provide a portal through which researchers can access information about the collection, and give casual readers a daily glimpse into the fascinating history of the community through posts like yesterday’s, which featured this very photo. Check out their Facebookpage and learn more about this incredible resource! 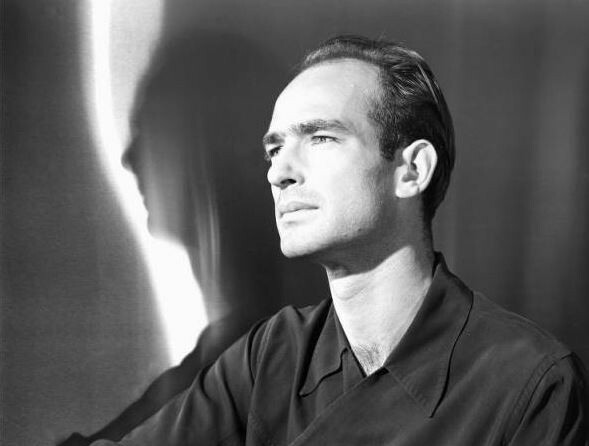 Harry Bertoia, 1942. Richard Askew/Cranbrook Archives. Harry Bertoia, who began studying at the Cranbrook Academy of Art in 1937 and was enlisted as the head of the Metalsmithing Department by 1938, might have felt an extra level of discomfort at the dining experience at Cranbrook School—only 24 years old when he began his tenure as an instructor, he likely looked the same age as many of the high school students. The formality captured in Bertoia’s letter is not overstated, however. Film footage of Cranbrook School in the 1930s shows a formalized dining experience that would be unrecognizable to today’s students, with uniformed maids delivering hot dishes to the young boys who line up at their tables in coats and ties, waiting to sit in unison. The film is featured in the Center’s current exhibition Cranbrook Goes to the Movies, on view now at Cranbrook Art Museum. Shelley’s Bertoia research, meanwhile, has proven productive, feeding into an exciting project that Cranbrook Art Museum is cooking up in honor of the 100th anniversary of Harry Bertoia’s birth in 2015. We can’t say more right now, but watch the CAM website as this project develops over the new few months. And, just because we love it, enjoy a photo of Harry Bertoia and Brigitta Valentiner at Cranbrook Academy of Art’s themed “Come as a Song” party in 1942! We featured it as a Photo Friday a while ago, but it is just too good to not post again. 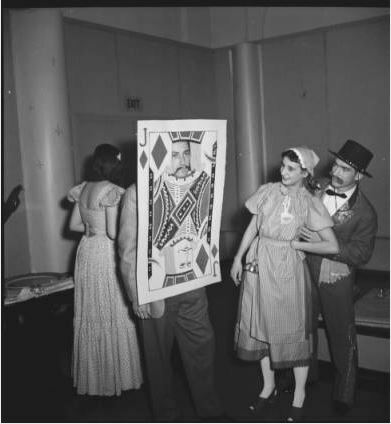 “Come as a Song” party; Harry Bertoia and fiance Brigitta Valentiner speak with an unidentified man in a playing card costume, 1942. Cranbrook Archives. Cranbrook student John Vining Ogden (left) competes for the ball in a match against the opposing team from Nichols, a rival school, 1960. Cranbrook Archives/Harvey Croze. As we prepare for the final round of World Cup soccer (Germany vs. Argentina, this Sunday), we’re looking back on Cranbrook’s own soccer history. Here, Cranbrook student John Vining Ogden tries to get one step ahead of a rival player as they vie for control of the ball. We’re especially taken with the Nichols’ players’ uniforms: with their striped jerseys, they look like a team made up entirely of referees!